It’s always really nice to hear what you guys have to say about me and my photos. It always makes me blush so much! I can't take a compliment anyway, so compliments with my work is just so wonderful to hear. Even a little thank you means a lot. "I was so chuffed when we managed to book her for our wedding because her reviews and work (both wedding and non-wedding related) is just gorgeous. Her enthusiasm and love for her job is obvious. She is expert at popping up the instant a perfect moment is occurring (it's like she has a sixth sense) and does it in such an unobtrusive way. She's also fab at herding/ crowd controlling family and friends for group shots and does it all with warmth and wit which is never easy when people need to get back to their beers! My parents had assumed Ellie was a life long friend because of how relaxed and chatty everyone was in her company. Keep up the good work Ellie and thank you for helping to make it such an amazing experience for us." "This lady is fantastic! We were lucky enough to have Ellie as our photographer and as soon as we met her, we knew she was going to be perfect. She is relaxed, laid back and so easy to get along with. I picked her brains for a number of reasons during the run up to our wedding and she was brilliantly helpful. On the day, she made us all feel at ease, snapped moments that we didn't even know were happening and captured us just the way we hoped for. The photos are ones we we will treasure forever. Thank you, Ellie, you ledge." 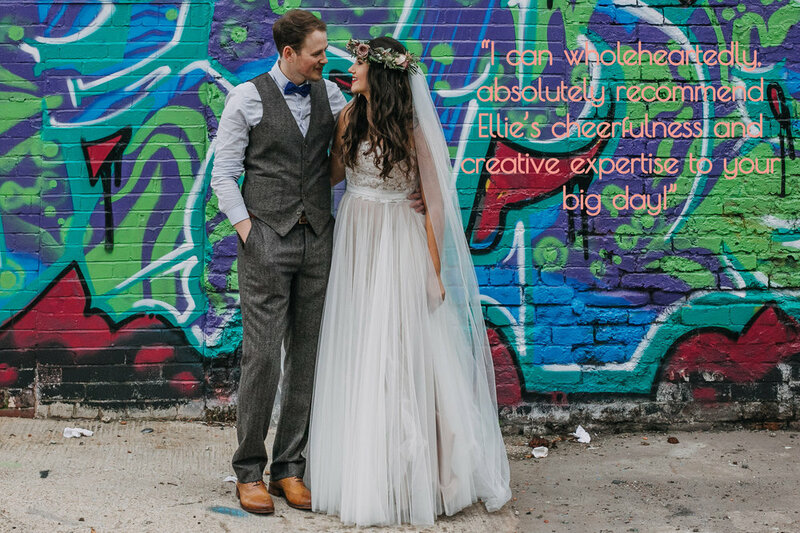 "It was a joy to have Ellie photograph our wedding – From visiting Ellie in her Sheffield studio we felt lucky and to have found such a wonderful photographer. On our wedding day Ellie fitted into our wedding party wonderfully, many guests have told us they didn’t even notice Ellie taking photographs! I was not quite prepared for how much I would come to rely on the photographs to capture the day, that goes by so quickly, and to see the parts of the day that we didn’t see! We laughed and cried our way through the photos that Ellie sent to us – she photographed the day exactly as I saw it, from small details to all of the dancing in the evening, our wedding day is all there exactly how we remember it, but now we have tangible memories too! All of our friends and family have told us how beautiful the photos are, and we couldn’t be happier to have an album of photos to treasure, that captures our day perfectly. Thank you Ellie!" "Ellie you star!! The photos are amazing! You have captured every single moment, many of which I had missed. So many personal details and so many wonderful memories you have captured. We are over the moon with them and we are so glad we had you! I can't wait to show our families! I have spent 4 hours watching them on a slideshow crying my eyes out and reliving our wonderful day. Thank you from the bottom of my heart." “Thank you for our photos they are AMAZING, we love them so much and cannot wait to show everyone. You captured the day perfectly and all the photos tell a story…some very funny ones. We literally couldn’t be happier with them, Thank you."